The following provides equations and a calculator for determining capacitance discharge rate of a capacitor at known voltage and charge. 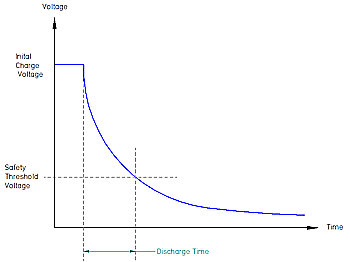 The value of capacitance to be discharged. If there is a wide tolerance, enter the maximum value. The voltage to which the capacitance is initially charged. The voltage threshold at which the capacitance is considered safely discharged. A typical value is 50V. The Ohmic value of the bleed resistor. The time taken to reach safe discharge condition.